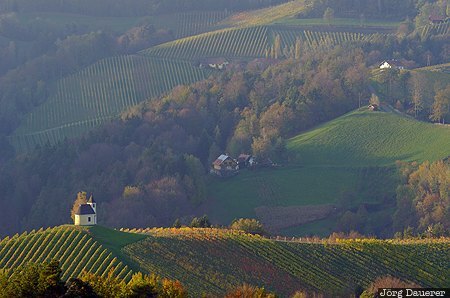 The small chapel called "Dreisiebner Kapelle" in the the middle of the colourful autumn vineyards near Gamlitz illuminated by warm evening light. Gamlitz is in the south of Styria (Steiermark), Austria. This photo was taken in the afternoon of a sunny day in November of 2013. This photo is in the Photo Calendar "Alps". This photo was taken with a digital camera.